BTN editor-in-chief Malcolm Ginsberg was on the inaugural scheduled flight into St Helena on Saturday (14 October) and will be reporting back on the island as a business and tourist destination. This ON TOUR is by way of an introduction. More will follow. It is a speck in the South Atlantic, a volcanic island 10 miles wide and five miles deep 2,500mi east of Rio de Janeiro and 1,210mi west of the Cunene River, which marks the border between Namibia and Angola in southwestern Africa. It is a British Overseas Territory, one of the most remote islands in the world, and was uninhabited when discovered by the Portuguese in 1502. Before the opening of the Suez Canal in 1869, St Helena was an important stopover for ships sailing to Europe from Asia and South Africa. Napoleon was exiled to the island after Waterloo in 1815, and from 1890, for seven years after the Boer War, Zulu King Dinuzulu ka Cetshwayo suffered the same fate. On the island is a memorial to 5,000 Boers taken prisoner during the conflict. In 1657, Oliver Cromwell granted the English East India Company a charter to govern St Helena and the following year the company decided to fortify the island and colonise it with planters. The first governor, Captain John Dutton, arrived in 1659, making St Helena one of Britain's earliest outposts outside North America and the Caribbean. A fort and houses were built. The island enjoyed a lengthy period of prosperity from about 1770. Captain James Cook visited in 1775. St James' Church was built in Jamestown, the miniature capital, in 1774, and Plantation House in 1791–1792; the latter since then has been the official residence of the governor. Although on the trade routes, St Helena was hardly self-sufficient, but could replenish ships with water and some provisions. 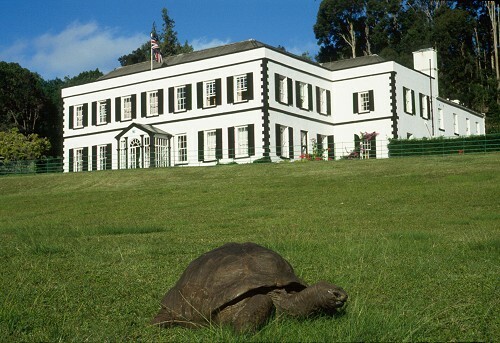 In 1815, the British government selected St Helena as the place to exile Napoleon Bonaparte. After the fiasco of the detention in Elba, it was clearly a better idea than sending him to the US where he might escape again. He died at Longwood House in 1821 and was returned to France in 1840. His casket was transferred to Les Invalides in Paris in 1861. Longwood House is now a museum owned by the French government. King George VI is the only reigning monarch to have visited the island. This was in 1947 when he, accompanied by Queen Elizabeth (later the Queen Mother), Princess Elizabeth and Princess Margaret, were travelling from South Africa in the battleship HMS Vanguard after a state visit. The Duke of Edinburgh came in 1957, Prince Andrew in 1984 and the Princess Royal in 2002. The St Helena Constitution took effect in 1989 and provided that the island would be governed by a governor, commander-in-chief and an elected executive and legislative council. The British Overseas Territories Act 2002 granted full British citizenship to the islanders, who at the 2016 census totalled 4,534. 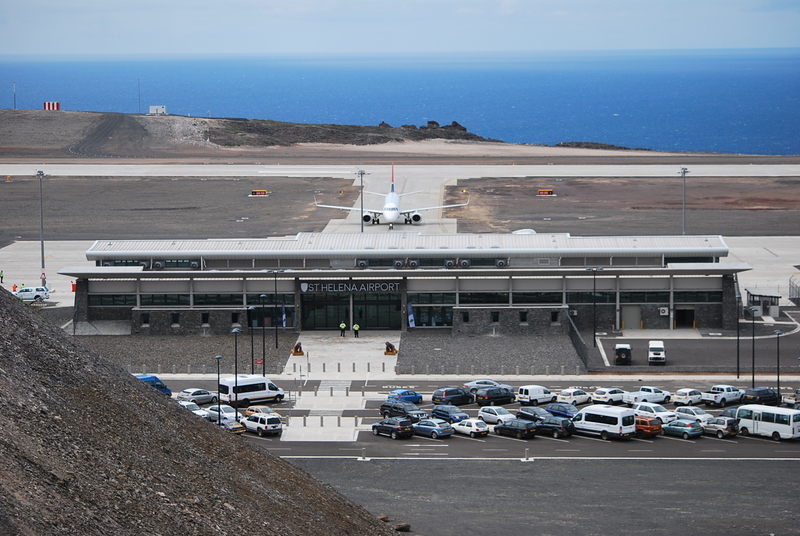 In March 2005, the British government announced plans to construct an airport in St Helena and the three-letter code HLE was allocated. An airport was considered more cost effective than replacing the Royal Mail cargo/passenger ship. In July 2010, a deal was signed, with the South African civil engineering company Basil Read leading the construction. For many years the Union Castle line called at St Helena on its service between the UK and South Africa but in 1977 this was replaced with infrequent visits by the Royal Mail Ship RMS St Helena. In 1989, Prince Andrew launched the replacement RMS St Helena to serve the island; the vessel was built specially for the Cardiff – Cape Town route and featured a full-service mixed cargo/passenger layout for around 150 clients. With the new flights, RMS St Helena will be withdrawn from service in 2018. She is unlikely to be scrapped, having been completed only in 1990. Refurbished and with her cargo capacity removed, she is likely to find employment as a specialist cruise ship. The first aircraft, a South African Beechcraft King Air 200, landed at HLE on 15 September 2015 prior to conducting a series of flights to regulate the airport's radio navigation equipment. South African airline Airlink was selected as the carrier to link St Helena with continental Africa. The airport's opening was due in May 2016, but it was announced in June of that year that it had been delayed due to concerns over high winds and windshear. Further calibration and research confirmed that the decision to make the runway 2,000m long, nearly twice that of London City Airport, was more than vindicated. Both airports are operational for the Embraer 190. HLE meets the standards set by the South African Civil Aviation Authority, which is the official monitor, with the infrastructure approved by Air Safety Support International (ASSI) a division of the UK’s CAA. Initially, Airlink is offering a weekly return flight every Saturday. The airport location means serious windshear makes it difficult to land from the north. It is perfectly safe from the other direction, but is plagued by tailwinds that decrease lift during landing. This imposes a weight restriction that reduces the EMB 190 capacity from 98 to 68, although this could be revised upwards with operational experience. The first trial passenger flight was flown by Airlink on 3 May this year from Cape Town via Namibe (Angola), with an AVRO RJ85 which returned the same day. The UK government has spent £275m on the construction of the airport, which is aimed at helping the island to become more self-sufficient, encouraging economic development while reducing dependence on British government aid. It is also expected to kick-start the tourism industry, with up to 30,000 visitors expected annually. The 4-star Mantis Hotel, with 30 bedrooms, had a soft opening on Saturday, nearly doubling the island’s hotel room capacity, plus bed-and-breakfast accommodation. Time was short for an in depth tour but in 24 hours I managed to get around. The highest point of the island is Diana's Peak at 818m (2,684ft). In 1996, it became the island's first national park. Much of the island is covered by New Zealand flax, a legacy of former industry, but there are some original trees augmented by plantations, including those of the Millennium Forest project, which was established in 2002 to replant part of the lost Great Wood and is now managed by the St Helena National Trust. The Millennium Forest is being planted with indigenous gumwood trees. There are no native land mammals, but cattle, cats, dogs, donkeys, goats, mice, rabbits, rats and sheep have been introduced. St Helena has a nine-hole golf course (you go round twice to complete an 18-hole round) and there are only nine greens but 18 tees, so it’s not quite the same on the inward half. The course is currently par-8. 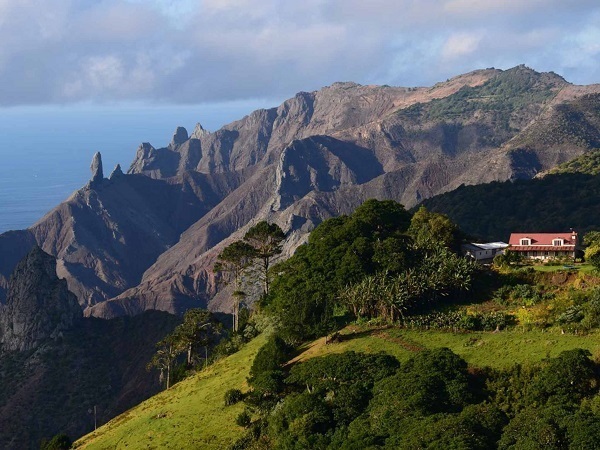 The four seasons are not recognised on St Helena, as there are no drastic weather patterns. The hottest months are between January and March. For much of the year, temperatures remain between 70-80°F (20-27°C) but nights and early mornings can get colder in June, July and August. Up to 30in of rain has been recorded but in terms of wet weather, the island is on par with London. The government of St Helena produces its own coinage and banknotes for the island’s own currency, the St Helena pound, which is at parity with the pound sterling. 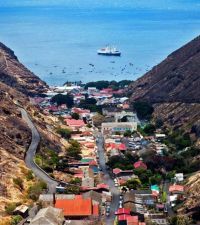 The Bank of St Helena was established on the island and Ascension Island in 2004 and has branches in Jamestown on St Helena, and Georgetown on Ascension. It took over the business of the St Helena Government Savings Bank and the Ascension Island Savings Bank. The airport was dubbed by The Guardian "the world’s most useless", a title it will take a little while to forget. It is certainly not useless. “Most expensive” might be more accurate, and while the island is perhaps a leftover from colonial times, we are now in the age of small aircraft flying a very long way. The British government had no alternative but to respect its responsibilities. A new ship in the 21st century was out of the question. The inbound flight from Johannesburg’s fine OB Tambo International Airport took just 7hr, including a refuelling stop in Windhoek (Namibia), where we met up, airside, with passengers from Cape Town. To the editor Malcolm Ginsberg how did you find your resent visit to sthelena and the operation of the New airport flight.as as always l follow BTnews every week from you im please you got invited to see first hand and to allowed more positive reporting for the airport and my fellow (saints) as we are comely known l am interested if you have any information if in the the very near future if there is any plan fights by the st helena travel agents that will fly from london base airports there is many St Helians live in uk who would be eager to get more information on this. Congratulations on your most resent award. Ray christopher Crowie Iceland. Really like the last photo.